2 million people in our state live on $4.47 a day – can you? From September 9-15, during Hunger Action Month, the Eastern Illinois Foodbank personally invites you to participate in the SNAP Hunger Challenge and live on $4.47 a day for seven days. That’s the average amount individuals in eastern Illinois are receiving from the Supplemental Nutrition Assistance Program, or SNAP. Try it for a week, a day, or even just a meal. It’s an exercise in empathy—a call to live in someone else's shoes for one week. By raising awareness of the barriers to accessing high quality, nutritious food on a food stamp budget, we hope to mobilize the public to end hunger in Illinois. This challenge is open to all individuals and involves living on what would be the weekly food stamps allowance in Illinois for an entire week, so you can get a sense of what it would be like to subsist on food stamps. This means eating on a budget of $4.47 per day, per person and includes all meals - breakfast, lunch, dinner, snacks, seasonings and drinks. It will last for seven straight days. Spend no more than $4.47 per day, including beverages. Only buy and eat/drink items that are allowed to be purchased with food stamp benefits. Don’t use food already on hand unless you deduct the value from your daily amount. Salt and pepper do not count against the daily cost allowance, but all other seasoning, cooking oils, condiments, snacks and drinks do. Try to include fresh produce and a healthy protein each day. Don’t accept food from family, friends, co-workers and others. Avoid free food anywhere. No outside food or dining out is permitted since you cannot use food stamp benefits on hot meals. You may need to cut coupons or search grocery paper ads on days that items are discounted. Keep a log of what was bought and eaten for each meal, as well as grocery receipts. Keep a daily journal of the experience. Did you feel deprived or restricted? Did you eat differently than usual? Were you hungry? 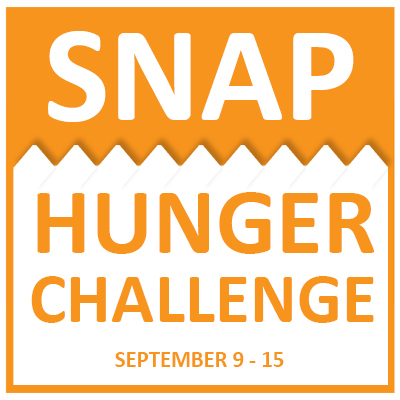 SNAP Challenge participants are encouraged to keep a daily journal and share their experiences—during and after the challenge—with the Eastern Illinois Foodbank as well as their friends, family and others. Blog about it. Post your daily journal online or write posts for your own blog. Include photos of your purchased food and meals. Tweet using the hashtag #HungerActionMonth and #SNAPChallenge. Share your thoughts, photos, links to your blog posts and facts about hunger in eastern Illinois. Use our handle, @eifoodbank, for possible re-tweets and continued conversation about the SNAP Challenge. Use Facebook to share daily updates, photos and an end-of-week recap with your friends. Post on Eastern Illinois Foodbank’s Facebook page to continue the conversation with other hunger-free champions as well as for possible sharing with their followers. Use your voice—talk about your experience with others. Did you come away with greater awareness and understanding for the hunger challenges that affect so many in our community? Have discussions with family, friends, co-workers, neighbors. Share your experience with members of your church, civic organizations and other clubs. Invite a representative from the Eastern Illinois Foodbank to provide insight into the issue and solutions surrounding hunger in eastern Illinois.